SELECTED MATERIALS: Top grade Cowhide and cotton-blend lining with exquisite hardware. ANA LUBLIN is committed to using advanced materials to bring the good design into reality. ELABORATE HANDCRAFT - Finest quality hand made by professional artisans with more than 63 years of experience. FUNCTIONAL STRUCTURE: 1 main compartment + 1 small thing pocket + 1 inner separated zip pocket + 1 inner zip pocket + 2 inner slip pockets + 1 back zip pocket, this good organizer design can hold you stuff tidy and orderly. 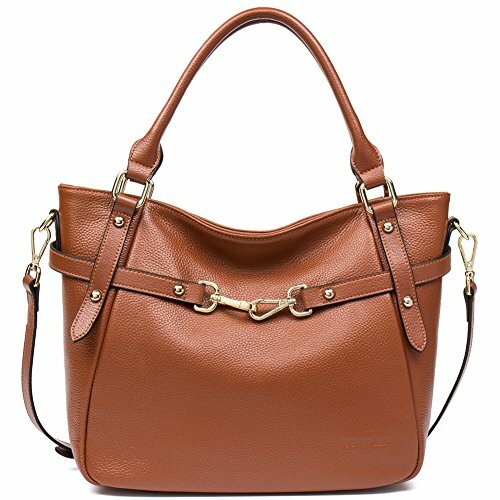 SUITABLE SIZE: 12.6(L) x 4.72(W) x 9.06(H) inch, the handle height is 7.48 inch, this is a bag with ideal size suit for most ladies, not too big or too small, just fit, a smart lady's choice.